I was inspired to have a go at making this delicious Vegetarian Paella after lunching with friends at Muse Cafe, located at the East Hotel in Canberra. When you’ve eaten something in a restaurant, but don’t actually have the recipe, you have to use a certain amount of guesswork, but the end result was delicious. Muse calls this dish Calasparra Paella – calasparra being a variety of rice especially suited to making paella. It’s not sold in any of my local supermarkets, but if you look online you can find a couple of specialty grocers who sell it. Arborio rice is a good substitute, but you need to use less liquid and stir it less, so it doesn’t go creamy and start to break down. Calasparra needs three times the volume of liquid to rice, whereas Arborio only needs about twice the volume. As you can see in this photo, I roasted the tomatoes with the other vegetables. They ended up a bit overcooked, which is why I have amended the recipe to add them halfway through the cooking time. I also roasted the beans and asparagus with the other vegetables, which unfortunately meant they lost their vibrant green colour. So again I have amended the recipe to cook the green veggies in water rather than in the oven. Either way works, it’s just about the colour. Heat half the olive oil in a heavy-based large saucepan, add the rice and stir fry for 2-3 minutes. Gradually add the stock, letting it be absorbed before adding more. Stir from time to time, but not too often or too vigorously. You may need slightly more or less stock as rice varies. When al dente add the saffron, chilli flakes and salt and pepper to taste. If liked, add a knob of butter, then cover and keep warm. Meanwhile roast the vegetables. Preheat oven to 200°C. Cut the onion, sweet potato and capsicum into 1-1.5cm squares and place in a bowl with the rest of the olive oil and salt and pepper to taste. Mix well then spread out on a shallow oven tray lined with baking paper. Bake for about half an hour, or until cooked. Halfway through cooking time give them a stir around and add the tomatoes. Meanwhile cut the asparagus and beans into 1.5cm lengths and cook in boiling salted water for 3-4 minutes then drain and refresh under cold water. Mix all the vegetables into rice and arrange on 4 serving plates, using a large stacking ring if you have one. Garnish with avocado, herbs, olive oil and lime wedges. Note: I made a large main course sized stacking ring by cutting the top and bottom off a large can of tuna with a can opener. Place in the middle a dinner plate. 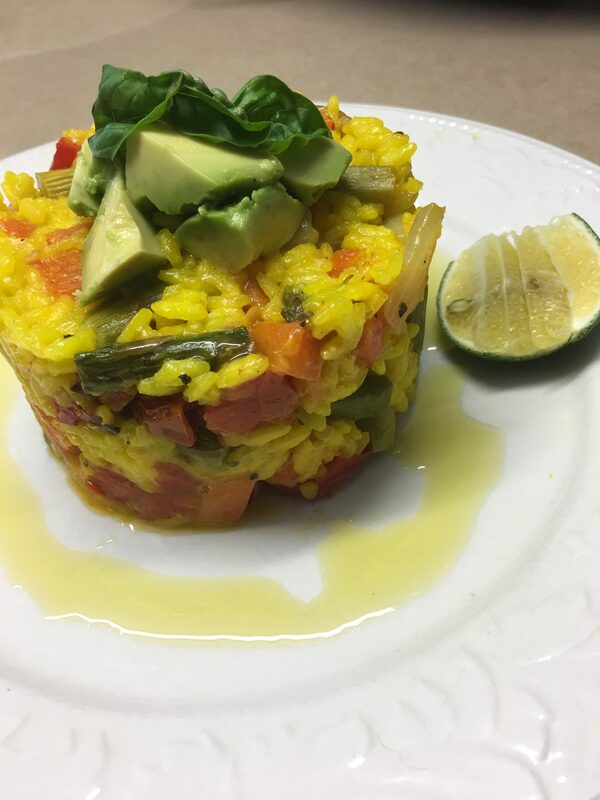 Fill with the paella and press down the top, garnish with avocado and herbs, then lift off carefully and serve. Variations: use eggplant, zucchini or peas instead of one of the vegetables. Fresh figs are in season for a very short time, but now is the time, if you live in Australia. One of my favourite ways to serve fresh figs is with smoked salmon. It may sound like a strange combination, but give it a try – I think it’s delicious. 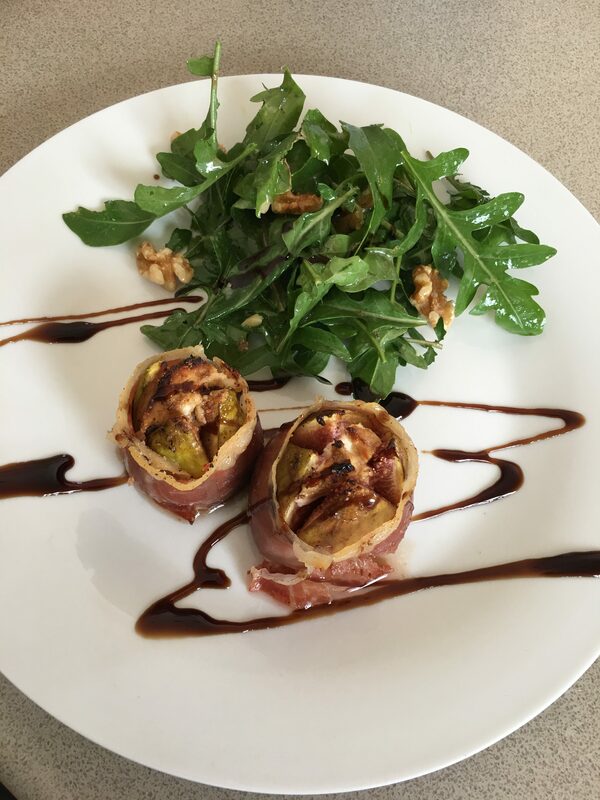 Another favourite recipe is this one where they are wrapped in Prosciutto, stuffed with goat’s cheese and then baked. The recipe serves two as a light lunch but is easy to multiply. Preheat the oven to 180°C. Remove stalks from figs then cut a cross on the tops. Squeeze gently from the bottom to open them up a bit. Cut each slice of ham in two lengthwise so you have 4 long strips. Wrap one around each fig, secure with a toothpick, then place in a small shallow baking dish. Stuff the cheese into the tops of the figs. Mix the balsamic, oil and honey and drizzle over. Season with S and P then bake for 15-20 minutes. 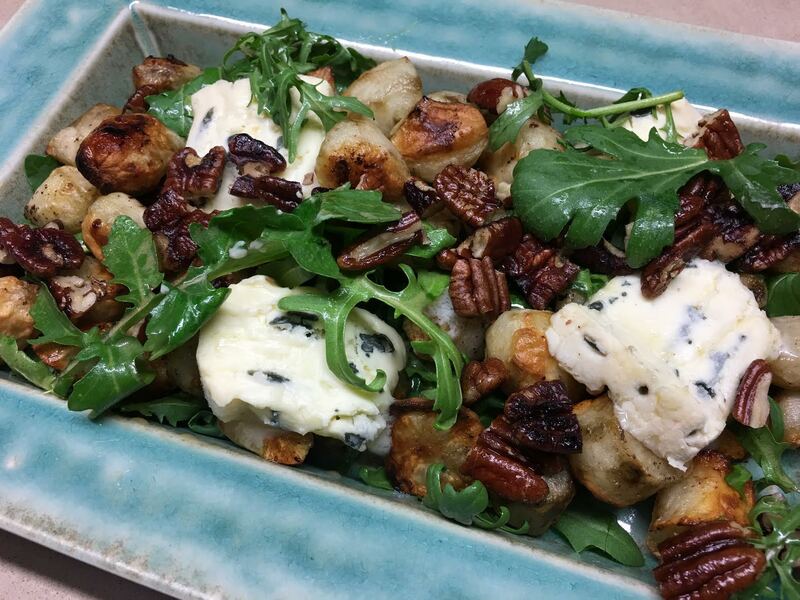 Serve with a rocket salad with some walnuts added and a simple oil and vinegar dressing. Garnish the plate with balsamic glaze. Cleaning out the freezer I found a ball of shortcrust pastry I had forgotten about. 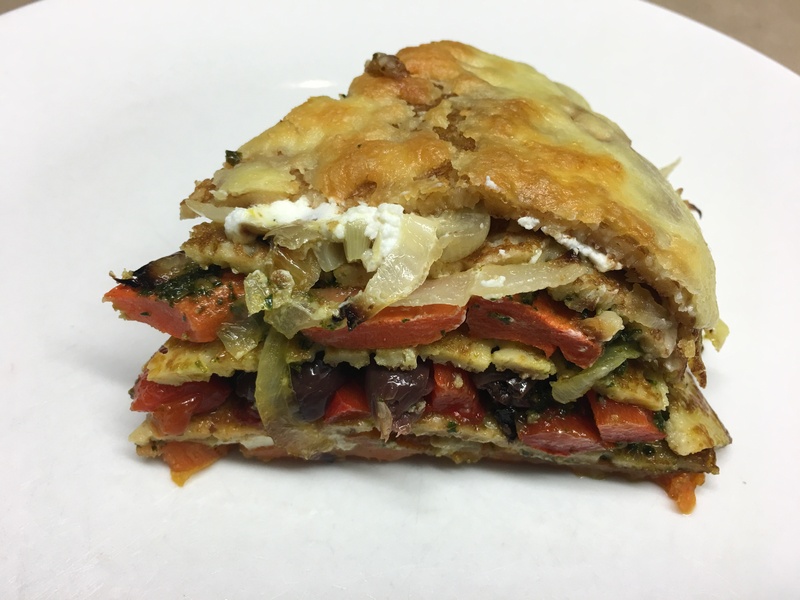 Once thawed I looked in the fridge to see what I could find to make a savoury tart, without going shopping, and came up with this. Leftovers heated up well for lunch the following day. If you have fresh peas in the garden by all means use those instead of frozen peas. Preheat oven to 180°C. Use pastry to line base and sides of a slice pan, about 20/25 cm by about 30cm. Place zucchini in a sieve and mix in a teaspoon of salt. Leave to drain, then push down on it to squeeze out excess liquid. Beat eggs with cream or milk and lemon rind. Add zucchini, peas and lots of pepper then pour evenly into the pastry case. Scatter cheese over the top then bake for 25-30 mins or until set. Meanwhile pour boiling water over the extra peas. Leave for a minute then drain. 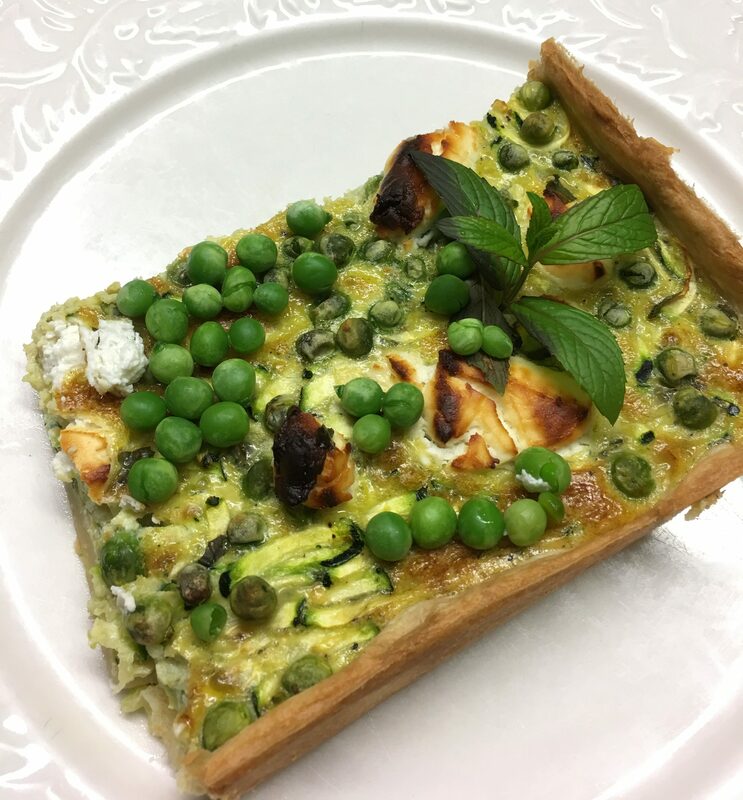 Cut the tart into squares and garnish with the extra peas and mint sprigs. Variations: use asparagus spears, thinly sliced on the diagonal, instead of the zucchini. A few weeks ago I was looking for good breakfast dishes on Café Cat to recommend to 2CC radio listeners who wanted to spoil their Mum on Mothers’ Day. As I looked through the Index I realised that, despite being into its seventh year, Café Cat had not yet published my absolute favourite egg dish, Oeufs en Cocotte, which is just a fancy French way of saying Baked Eggs. Serve this for breakfast, brunch, lunch or supper to put a smile on everyone’s face. If you’re a fan of eggs I guarantee you’ll like this one. Once you’ve made them a couple of times you will know exactly how long they take in your oven. Other delicious egg recipes you might like to try are Salad Lyonnaise à la Madeleine and Spanish Eggs with Jamon. Preheat oven to 180°C. Make the breadcrumbs by whizzing a slice or two of stale bread in the food processor. Don’t make them too fine. Butter two half cup ramekins and put a small piece of butter in each. Heat the rest of the butter in a non-stick frying pan and cook the breadcrumbs, stirring, until golden brown. 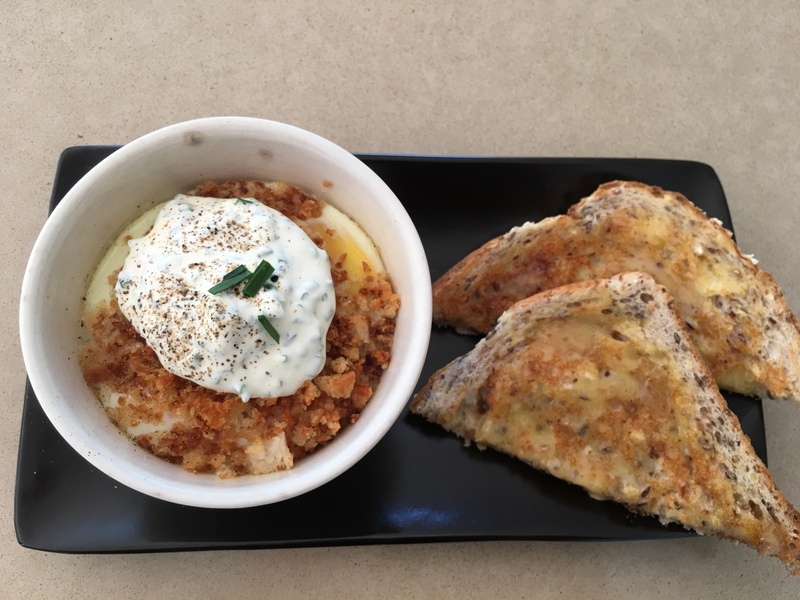 Place half the breadcrumbs in the bottom of the ramekins, then two eggs in each dish, then top with the remaining breadcrumbs. Place ramekins in a baking dish and pour boiling water to come halfway up the sides. Bake for 15 mins, or until whites are set, but yolks are still soft in the middle. Press the tops with your finger to check. Mix sour cream with chives and dollop on top of the dishes, then sprinkle a few more chives on top. Serve with buttered toast and pass round a salt and pepper mill. Variations: if you don’t have chives use finely chopped spring onion tops. This colourful vegetarian dish was created when I had some pancakes which needed using up. You could probably use round wraps or soft tortillas instead of the pancakes. 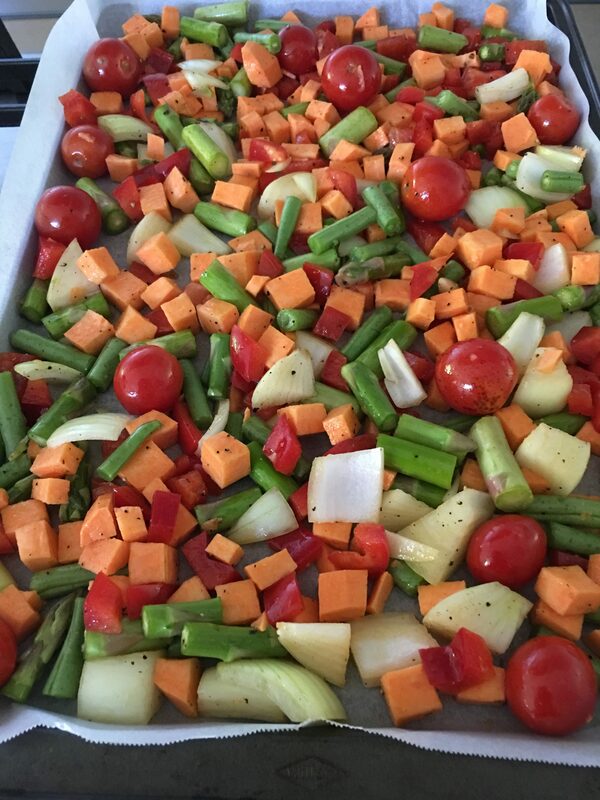 I used one kind of vegetable for each layer, but if you’re in a hurry just roast all the vegetables mixed together. Choose a non-stick springform pan the same diameter as the pancakes. Preheat oven to 200°C. Slice all the vegetables into thick slices rather than the usual chunks, so they’re flatter. Mix each one with s little oil, salt and pepper, then spread them out in one layer, individually, on shallow baking trays lined with baking paper. Roast for 20-30 mins or until cooked and starting to brown. You can line the bottom of the pan with baking paper, but I found it made cutting the finished dish more difficult as the paper got in the way, so next time I’ll leave it out. Spray cake pan with oil and place one pancake on the bottom. Arrange one vegetable over the pancake, dot with a few pieces of goat’s cheese or feta, drizzle with some pesto (add some oil if it’s too stiff), then top with another pancake and continue with the other vegetables, one for each layer. I put the olives in the onion layer. Finish with a pancake, sprinkle with cheddar or parmesan. Can be made ahead to this stage and kept in the fridge, covered. Preheat oven to 180°C. Bake the pancake stack for 30-40 minutes or until golden brown on top and heated through. Serve in wedges with a green salad. Variations: use other vegetables such as zucchini, parsnip, pumpkin, mushrooms, asparagus, corn etc. Add another layer or two if you like. We grow Jerusalem artichokes so I’m always looking of new ways to serve them. If you look in the index you will find several recipes. This is a slightly adapted recipe from Maggie Beer. I made half this recipe to serve two. Wash, scrub and trim the artichokes. Slice thickly or if small cut them in half. Preheat oven to 200°C. Mix artichokes with the oil and butter in a bowl then spread on a baking sheet lined with baking paper. They should be in a single layer, so you may need two baking sheets. Roast for 45 minutes to an hour, or until tender and golden brown. Place walnuts or pecans in a small frying pan with the maple syrup and olive oil and stir over moderate heat until slightly glazed. Cool, then coarsely break them up. Place dressing ingredients in a jar with a lid and shake well. Arrange artichokes, rocket and cheese on serving platter. Scatter over the nuts, drizzle with a little dressing and season lightly with salt and pepper. This recipe was inspired by a bruschetta we ordered while we were in Chicago last year. 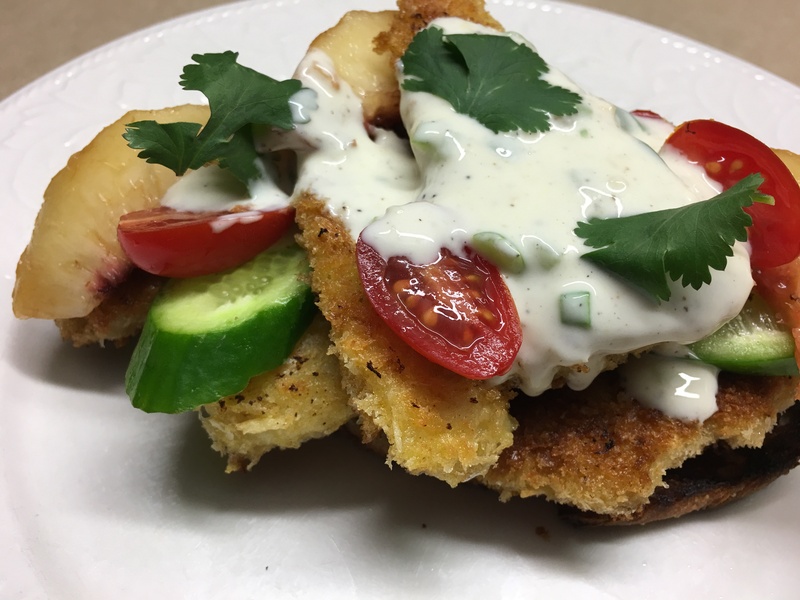 I remember it was topped with homemade fish fingers – otherwise known as “goujons”- peaches, tomatoes, cucumber and a creamy dressing. The rest I had to invent. The tomato is often thought of as a vegetable, but in fact it’s a fruit. If you don’t like fruit with savoury dishes, you won’t like this recipe, but I love the fresh flavour combination. If liked leave out the bread. Leftover dressing is delicious served with any salad. Coat fish fingers (goujons) with the seasoned flour, shaking off the excess, then with the beaten egg and lastly with the breadcrumbs. Heat oil and butter in a large frying pan and fry them for 2-3 minutes each side, or until golden brown and cooked through. Drain on paper towels. Place all ingredients for dressing in a jar with a lid and shake well. Brush the bread on both sides with the olive oil (if liked mix in a crushed clove of garlic) then grill till golden. I toasted mine in an electric sandwich press which works well and avoids having to turn on the grill. Arrange toasted bread slices on 4 plates. Arrange the fish on top then garnish with the cucumber, the tomato halves and the peach or nectarine slices. Drizzle with some of the dressing and garnish with fresh herbs. This recipe takes a little longer than most of the recipes on this blog, but it’s really not that complicated and an elegant way to feed a crowd. I bought the salmon at Costco because their salmon never has any bones in it. If there’s one job I really hate it’s removing salmon bones with tweezers. In Australia puff pastry comes in pre-rolled squares which measure about 25x25cm. If you live somewhere it’s sold in a block you will need enough to roll out to a rectangle which is a bit bigger than double the size of the salmon. Clean leeks to remove any grit then chop finely, using all the white part and some of the green. Heat half the butter in a frying pan and cook leeks gently, stirring often, for 10 minutes or until soft but not brown. Add cream and cook until evaporated. Season to taste. Wash spinach and remove stalks. Place in a large saucepan with just the water clinging to the leaves and cook, stirring, until wilted right down. Place in food processor with the remaining butter and process to a slightly chunky puree. Season to taste. Prepare the leeks and spinach the day before and keep refrigerated. Roll out pastry. I used three ready-rolled squares. Two squares stuck together and one square cut in half and stuck together lengthwise then joined onto the two big squares along the long side. Roll over the joins with a rolling pin so they stick. 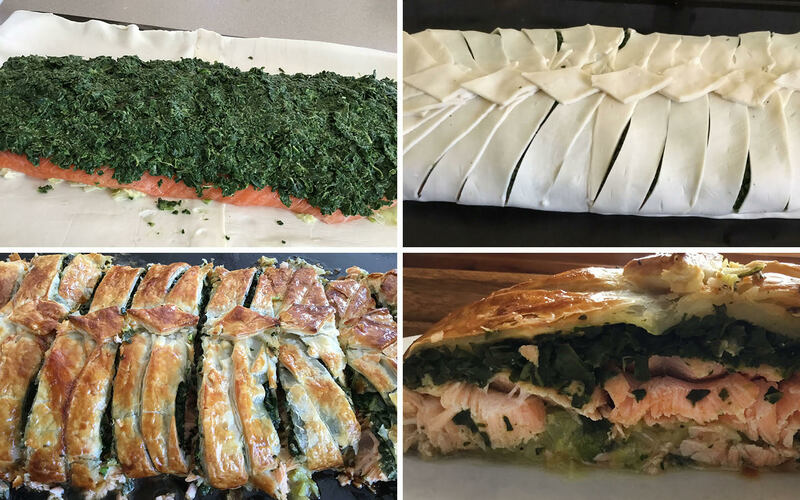 If using a block of pastry you will need to roll it out thinly to a rectangle slightly larger than twice the size of the salmon. Place pastry on a lightly greased baking tray – I used the shallow oven tray which came with my oven. If liked, line the tray first with baking paper. Spread the leek mixture down the centre of the pastry in the shape of the salmon, then lay the salmon on top and cover with the spinach. Make sure the salmon is covered entirely by the leeks on the bottom and the spinach on the top. Fold in the two ends of the pastry which should be 2-3 cm longer than the fish. Cut diagonal slashes into the pastry on the two sides as far as the salmon, then bring them in alternately to create a pseudo-plait, pinching the ends together. If it doesn’t look like a work of art, don’t worry it will look amazing when it’s cooked. If liked, arrange a row of diamond shapes, made from pastry off-cuts, down the join in the middle, to cover any imperfections. Refrigerate until serving time. Preheat oven to 180°C. Brush pastry all over with beaten egg. Bake for 30-40 minutes or until well-browned. Place mayonnaise and dill in food processor and process until smooth. Serve slices of the salmon pie with the dill mayonnaise. New potatoes and a steamed green vegetable such as broccolini, asparagus, green beans or snow peas go well with this. Fermented food is really good for maintaining healthy gut bacteria. I have just made my first batch of sauerkraut and as it’s an integral ingredient in the famous American Reuben Sandwich I decided it was a good way to try it. The origins of this sandwich are not entirely clear, but according to one version, a man called Reuben Kulakofsky ordered a corned beef and sauerkraut sandwich in a hotel in Omaha USA in 1928. A young chef by the name of Bernard Schimmel came up with the rest. So I guess it should have been called a Schimmel sandwich! If you don’t have Thousand Island dressing and can’t be bothered to make it, mix two parts mayonnaise with one part tomato ketchup and add a dash of Tabasco or Worcestershire Sauce to give it a bit of bite. The photo shows two sandwich halves stacked one on top of the other. 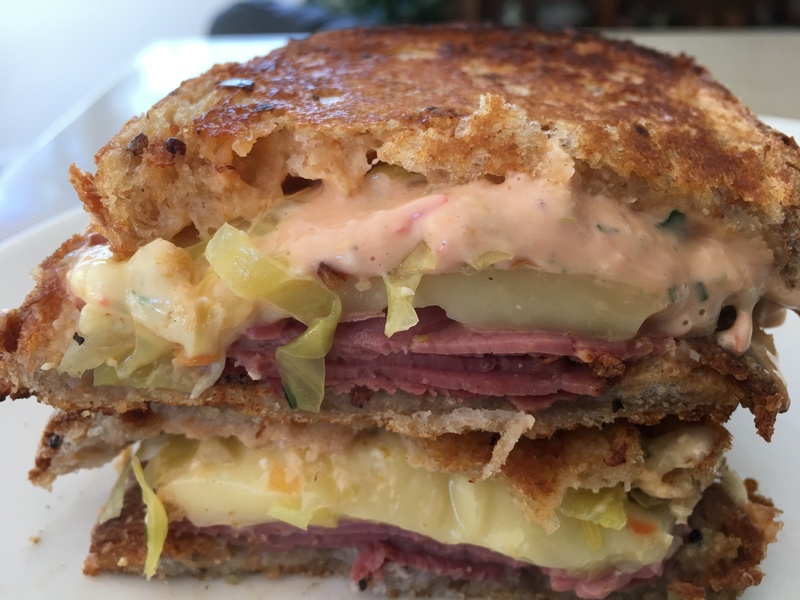 Make sandwiches using rye bread spread with Thousand Island Dressing, filled with generous amounts of corned beef or pastrami, Swiss cheese and sauerkraut, then topped with a second slice of bread. Butter the outsides of both slices of bread and cook in a sandwich press until nicely toasted. You can also cook them in a frying pan, with a weight to flatten them down a bit, but a sandwich press is the best solution and a worthwhile investment if you’re a fan of toasted sandwiches. Cut the sandwiches in half and garnish with dill pickles, radishes and potato crisps. Place mayonnaise, ketchup and onion in food processor and mix till smooth. Add remaining ingredients and pulse briefly so you end up with a slightly chunky dressing. Keep refrigerated and use within 5 days. 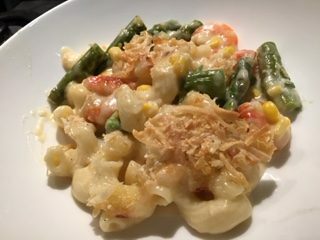 My mother made Macaroni Cheese when we were kids. Along with Spaghetti Bolognese it was our only experience with pasta back then, before Italian cuisine took off. A baked pasta dish is the ultimate in comfort food. On a recent trip to the USA I ordered a macaroni cheese which had large chunks of lobster folded through. It was divine. Lobster is expensive so it always seems a sin to do anything to it but eat it cold with mayonnaise. But if you´re fortunate enough to live somewhere where it’s cheap and plentiful, by all means add some to this dish. If not, the recipe also works well with prawns or crab meat. Preheat oven to 180C. Trim off the woody ends of the asparagus, then cut them into 3 cm lengths. Cook in boiling salted water for 4-5 mins or until just cooked, then drain. Cook the corn and the pasta in boiling salted water and drain. Heat butter in a medium non-stick saucepan. Add flour and stir for a minute or so to cook. Gradually add the milk and cream, stirring until you have a thick sauce. Add grated Parmesan and seasonings. Fold in the asparagus, pasta, corn and chosen seafood, then spread into a greased shallow baking dish. Top with the breadcrumbs and extra Parmesan. Bake for 30 mins or until golden brown. Serve with a simple green salad or steamed green vegetable such as Broccolini, Green Beans or Broccoli. Variations: use 2 cups milk and omit the cream; use diced chicken or ham instead of the seafood. Use grated cheddar instead of Parmesan.